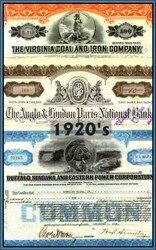 Decade Package from the 1920's includes 3 beautifully engraved Certificates. The companies included in this package are the Public Utility Holding Corporation of America, American Exchange Irving Trust Company and The Virginia Coal and Iron Company . These historic documents have different vignettes and are described more fully on our website. These certificates are all hand signed and are over 71 years old. These certificates sell for $68.00 if you buy them separately, but we are offering them in our 1920's GIFT OF HISTORY Decade Package for substantially less!